Farmer's Market Tents - Customize Your Market Canopy Now! CUSTOM FARMERS MARKET TENTS TO STAND OUT! Our custom market tents are ideal for showcasing your business and to bring more foot traffic to your booth at any farmers market! You can customize it with your logo or any design to maximize your visibility. You can also add a counter, mesh walls or an awning to your tent to make your life easier during service hours. Customize your tent top and side walls with any colors logo or design for a professional presentation. Our canopies are easy to set up and designed with a tool free, pop-up deployment system. Our 4 lines of pop up tents are designed to meet your needs and your budget. They come in 10×10, 10×15 and 10×20 size. Our waterproof market tents will provide your products protection against the rain, snow, sun and wind. The 11 oz vinyl is heavy duty, easy to clean and to maintain. It is mold resistant for longer durability, making it ideal for all weather conditions. It is also UV resistant and fire retardant. Our waterproof tents will give your market booth a perfect presentation. The top comes in different solid colors and you can complement it with walls, rail skirts or a counter. 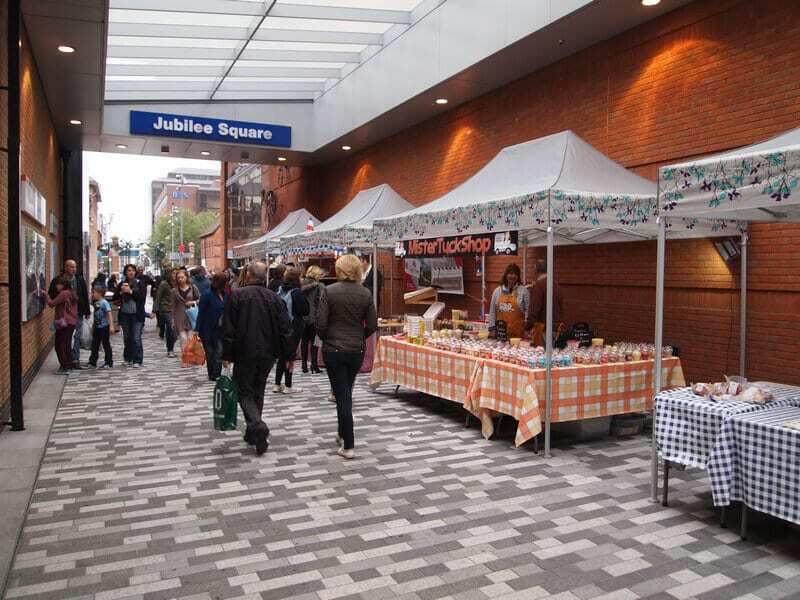 Our market canopies are easy to set up with our tool- free, simplified deployment system. Offered printed or in solid colors, you can accent your farmers market tent by adding walls. You can select from our polyester, mesh or vinyl fabric. Equipped with a zipper that allows you to close your market tent doors. This wall is offered printed and non – printed. The window covers half of the panel. A clear vinyl is used for the window to bring in light. Create your own design or select one of our solid colors. All of our rail skirts come with poles and clamps to attach to the tent legs. Give your canopy additional shade and protection with our awning or simply add a special branded touch to it. It’s easy to install – it comes with clamps that connect to the tent leg.. This counter is ideal for serving food & beverages or to showcase products at any farmers market. It comes as a kit – it includes hardware and a rail skirt. Need a tent for your next farmer’s market? We offer a variety of different printing methods available for your ideal market booth. Our focus is to deliver high resolution printed items that will highlight your business. *PMS colors are for reference only and may vary slightly from actual color. Includes 4 stakes, 4 ropes and 1 storage bag. Designed to hold your tent in place in case of heavy winds. Ballast weights are the perfect solution for securing your tent on asphalt. Can be filled with up to 20lbs of sand for security. Soft case to protect your frame and top during transportation. Durable shipping case with wheels and handle. Store and protect your walls. Fits up to 4 walls. Fits up to 4 rail skirts for transporting. Attach these to your frame. Lasts up to 8 hrs. Comes with a Wall & USB Charger. Attaches to tent’s leg and holds any type of flag we manufacture.